If you are organizing a hen party Ibiza 2019 and you have never been to Ibiza before, you are probably quite lost at the moment. But don’t worry. You are on the right web site! We have special offers for hen do Ibiza with several options depending on the season and number of hours on board our gorgeous sailing boats and catamarans. We do have different options that can fit to your need, going from a small group of 8 people to a big group of 60 people.Our sailboats and catamarans are set up with, DJ and onboard bars, you dont need to worry about anything, just get here with everyone and enjoy. Our 4 different boats are all different size and style to offer the best for your party, so you all will have lots of room to lay down, sunbathe, and have the best hen do ever! As we also do Water-Sport, we can offer to add most of our productos to you party. As Jet Skis, Parasailing. Banana Boat,etc. You can board our catamaran around 12:00, at the Yacht Club in San Antonio, in Ibiza. We will sail for around one and a half hours and anchor at the beautiful Cala Bassa beach. 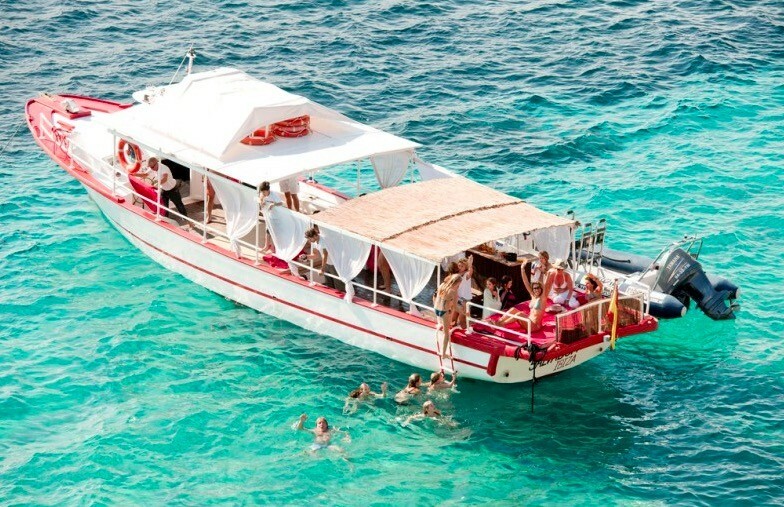 You can have lunch on board or disembark at the amazing Cala bassa Beach Club. We always advice to disembark for lunch so you can stretch your legs and do not worry about your hours on board, since we will give ou a complimentary extra hour so you don’t feel that you are missing time of your ibiza hen do on our catamaran. After lunch we will sail for one more hour all the way to Playas de Compte (also known as Cala Conta). We will drop the anchor and you can jump in and practise some snorkeling in the famous crystal clear and turquoise waters off this white sand beach. Then about 18:30 we will set sail back to to port, but stopping first in front of the legendary Cafe del Mar and Cafe Mambo just in time to admire an amazing sunset on board right in front of the hundreds of people who gather on land to see the sun setting under the Mediterranean. Our catamaran will appear in all the sunset pictures that tourists take from the shore. 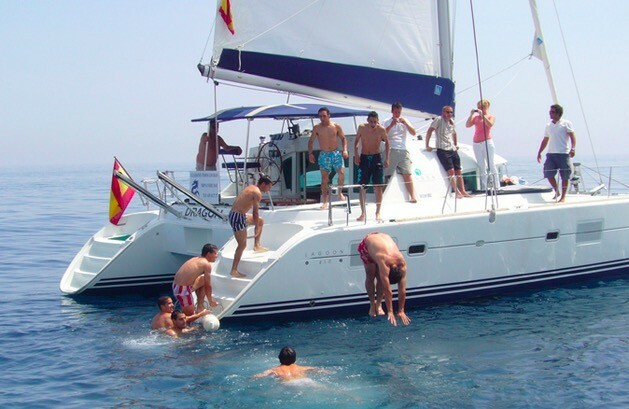 The perfect ending for catamaran hen party in Ibiza sea adventure.